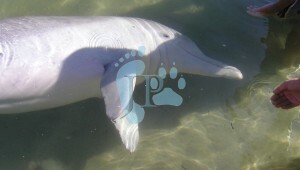 Indo-Pacific Humpback dolphins live in the Great Sandy Strait between Fraser Island & the mainland. They swim l5 kilometres every morning to come and interact with us at TCB. Their average cruising speed is between 2 and 7 knots, so the swim in could take them up to two hours. If along the way they encounter a school of fish or other dolphins they may want to stop to fish or play, and therefore don’t come in at exactly the same time every day. Indo-Pacific Humpback Dolphins are an estuarine dolphin, and they only like warm, shallow, sheltered waters such as we have here. They will never go out to sea, as they don’t like water deeper than 20 metres. 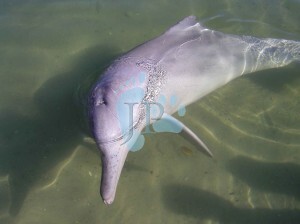 They are a shy dolphin, and do not usually like to interact with people and boats. If you are in a boat and you encounter a pod, they will tend to take a tail dive, and go deep under water, and scatter so that they emerge in all different directions. They do not bow- or stern-ride on the wake of a boat like bottlenose and common dolphins do. Because of their familiarity with the Tondalao however, they do approach and play with us on this boat. Approximately 50 years ago, a female dolphin later to be known as Scarry, was injured by a fishing trawler out in the Strait. The fishermen brought her in to TCB to nurse her back to health. Scarry became accustomed to the regular food given to her by local people, and once she recovered from her injuries she continued to come in to TCB regularly for a visit. Like many dolphins in this area, Scarry used the relatively shark-free waters of the TCB Inlet to seek protection when she was raising a calf. So it was that we were able to see Mystique for the first time, around April 1992. For two years Mystique visited the Bay with Scarry, while she taught him the skills associated with being a ‘wild’ dolphin, which include socialization as well as survival skills. Dolphins teach their young in much the same way we do, with vocalizations and even slaps if they misbehave. Eventually Scarry was confident that Mystique had learned to be a ‘wild’ dolphin and she began to let him interact with people. November 2002 was the last time we saw Scarry. At that time she would have been approximately 52 years of age. Because Indo-Pacific Humpback Dolphins have not been widely studied, we are not sure whether this is exceptionally old age for these dolphins, as bottlenose and common dolphins tend to live for between 25 and 35 years. Whether humpback dolphins live longer because they are living in relatively sheltered waters, or whether Scarry lived to such an old age because she was getting a fresh source of quality food every day from us, we will never know. 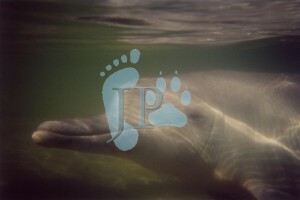 The wonderful legacy of Scarry is of course her son Mystique, who is the dolphin you might see here today. “In 2004 the owners of Barnacles decided to put their business on the market and this was the first we heard of a “supposed secret agreement” between the owners and Parks and Wildlife that on the sale of the café, then all feeding rights were to be revoked. Eventually the business was sold in October of 2005. The new owners were unaware of this “supposed secret agreement” and so they took on the café in the belief the main draw-card, the dolphin feeding would continue. Parks and Wildlife said it was a valid agreement, the previous owners said they never ever entered into such an agreement. Caught in the middle were the dolphins and the public and us volunteers. How do we tell the dolphins that the café has been sold and because of this, then there will be no further feeding for you, sorry, but that is it. 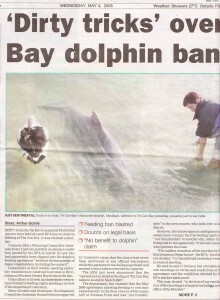 With the ban came a $250 fine for being in the water with and feeding a wild dolphin. The new owners decided not to bow to the pressure placed on them by Parks and Wildlife and so the feeding continued. On September 28, 2005, Ms Desley Boyle, the Environment Minister in the Beattie Labour Government, issued a statement that all feeding was to cease forthwith. If feeding did not stop, the owners of Barnacles would be fined up to $250,000 or a jail term in lieu thereof and each person feeding could receive a fine up to $250. 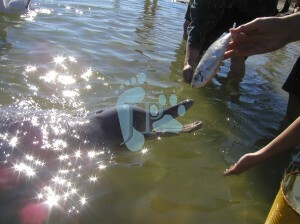 The owners continued to feed the dolphins daily despite this ban. Parks and Wildlife Rangers were present at each feeding. 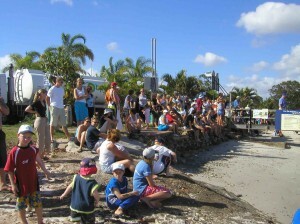 As volunteers to this centre, we encouraged all visitors to protest to the National Parks Authority and also to the Queensland Government, stating what a ridiculous ban this was. Rangers made notes of the feeding, recording dates, times, the number feeding, etc, and also filmed this activity too. We stressed in out talks to the public that by all means take your complaints to Parks and Wildlife and also to Ms Desley Boyle, the Environment Minister in the Queensland Government responsible for implementing this ban but please do not hassle the Rangers, as they are there doing their job. This the public adhered to. 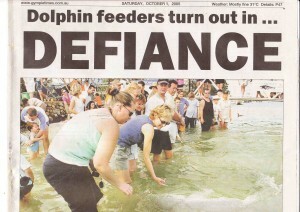 The Gympie Times supported the Dolphin feeding by writing regular articles about the battle. All the major TV channels from Brisbane attended to film the activities and this material was presented in either their news services or current affairs. Frank Robson from the SMH came along and wrote an explosive story which helped to bring the news to the world. 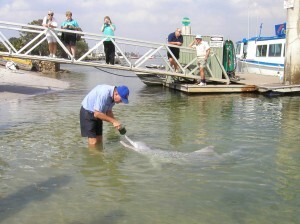 On October 8, 2005, the Premier of Queensland, Mr. Peter Beattie, stepped in and revoked the law banning the feeding of these dolphins and feeding was allowed to continue with the owners of Barnacles required to put in a list of what they wanted, which included the feeding of the dolphins, and Parks and Wildlife would look at that and decide if there was room to meet in the middle so feeding could continue. People pressure and sensibility finally won out in this instance. I found Jennifer Parkhurst to be a dedicated volunteer at this dolphin site and together with myself and the other volunteers, we were able to run a very professional outfit. 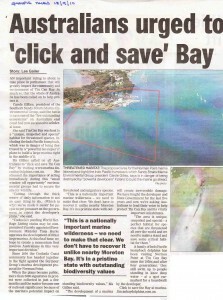 If the marina goes ahead we can say goodbye to the dolphins. Tin Can’s tourism will fall along with it’s economy. The marina will bring no employment to the village as it will be built using outside contractors and their employees.The existing marina isn’t full so what’s the point apart from an outside developer making money. Goodbye dolphins hello leeching. 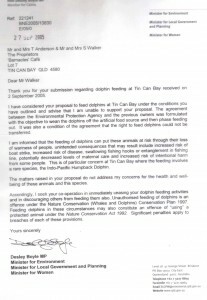 Ahhh, so it is OK for Andrew Powell and others to feed the dolphins in Tin Can Bay, but heaven help you if you feed a dingo on Fraser Island. Hi Phil, no i dont give lessons. The best way to learn is to take the camera off auto and check each photo as you take it, I usually shoot on TV = Time Value, becasue i like to choose a fast shutter speed for photographing wildlife. you might like to choose AV = Aperture which gives you a good choice of depth-of-field. good luck, i am sure you will enjoy your new camera. I know, its difficult to believe that was only a few years ago. The harsh realities/battles of life certainly take their toll mentally as well as physically. Ray rang around a month ago and referred to the ‘dolphins’, and i went to the box of his letters and found all these news clippings. it was haunting how closely parallelled these two scenarios were. 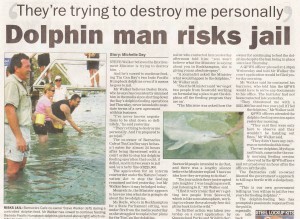 AG could exchange the word ‘dolphin’ in any of his articles with the word ‘dingo’, they have such an eerie similarity. it’s a shame that animals get caught up in such fierce political arenas. 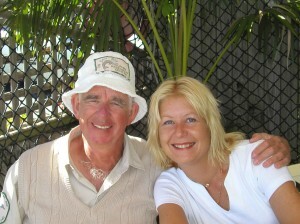 Strewth, you look so young and carefree in that pic with Clive, I hope I see that person one day soon.